"Remember the Alamo" redirects here. For the song, see Remember the Alamo (song). "Alamo" redirects here. For the site of this battle, see Alamo Mission in San Antonio. For other uses, see Alamo (disambiguation). The Battle of the Alamo (February 23 – March 6, 1836) was a pivotal event in the Texas Revolution. Following a 13-day siege, Mexican troops under President General Antonio López de Santa Anna reclaimed the Alamo Mission near San Antonio de Béxar (modern-day San Antonio, Texas, United States), killing the Texian and immigrant occupiers. Santa Anna's cruelty during the battle inspired many Texians, both legal Texas settlers and illegal immigrants from the United States, to join the Texian Army. 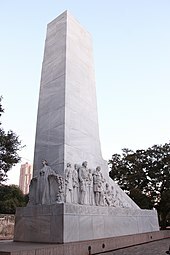 Buoyed by a desire for revenge, the Texians defeated the Mexican Army at the Battle of San Jacinto, on April 21, 1836, ending the rebellion. Several months previously, Texians had driven all Mexican troops out of Mexican Texas. About 100 Texians were then garrisoned at the Alamo. The Texian force grew slightly with the arrival of reinforcements led by eventual Alamo co-commanders James Bowie and William B. Travis. On February 23, approximately 1,500 Mexicans marched into San Antonio de Béxar as the first step in a campaign to retake Texas. For the next 10 days, the two armies engaged in several skirmishes with minimal casualties. Aware that his garrison could not withstand an attack by such a large force, Travis wrote multiple letters pleading for more men and supplies from Texas and from the United States, but the Texians were reinforced by fewer than 100 men because the United States had a treaty with Mexico, and supplying men and weapons would have been an overt act of war. In the early morning hours of March 6, the Mexican Army advanced on the Alamo. After repelling two attacks, the Texians were unable to fend off a third attack. As Mexican soldiers scaled the walls, most of the Texian fighters withdrew into interior buildings. Occupiers unable to reach these points were slain by the Mexican cavalry as they attempted to escape. Between five and seven Texians may have surrendered; if so, they were quickly executed. Most eyewitness accounts reported between 182 and 257 Texians died, while most historians of the Alamo agree that around 600 Mexicans were killed or wounded. Several noncombatants were sent to Gonzales to spread word of the Texian defeat. The news sparked both a strong rush to join the Texian army and a panic, known as "The Runaway Scrape", in which the Texian army, most settlers, and the new, self-proclaimed but officially unrecognized, Republic of Texas government fled eastward toward the United States ahead of the advancing Mexican Army. Within Mexico, the battle has often been overshadowed by events from the Mexican–American War of 1846–48. In 19th-century Texas, the Alamo complex gradually became known as a battle site rather than a former mission. The Texas Legislature purchased the land and buildings in the early part of the 20th century and designated the Alamo chapel as an official Texas State Shrine. The Alamo has been the subject of numerous non-fiction works beginning in 1843. Most Americans, however, are more familiar with the myths and legends spread by many of the movie and television adaptations, including the 1950s Disney mini-series Davy Crockett and John Wayne's 1960 film The Alamo. In 1835, there was a drastic shift in the Mexican nation. The triumph of conservative forces in the elections unleashed a series of events that culminated on October 23, 1835, under a new constitution, after the repeal of the federalist Constitution of 1824. Las Siete Leyes (Spanish: [las ˈsjete ˈleʝes], or Seven Laws were a series of constitutional changes that fundamentally altered the organizational structure of Mexico, ending the first federal period and creating a unitary republic, officially the Mexican Republic (Spanish: República Mexicana). Formalized under President Antonio López de Santa Anna on 15 December 1835, they were enacted in 1836. They were intended to centralize and strengthen the national government. The aim of the previous constitution was to create a political system that would emulate the success of the United States, but after a decade of political turmoil, economic stagnation, and threats and actual foreign invasion, conservatives concluded that a better path for Mexico was centralized power. The new policies, and the increased enforcement of immigration laws and import tariffs, incited many immigrants to revolt. The border region of Mexican Texas was largely populated by immigrants from the United States, some legal but most illegal. These people were accustomed to a federalist government and to extensive individual rights, and they were quite vocal in their displeasure at Mexico's law enforcement and shift towards centralism. Already suspicious after previous American attempts to purchase Mexican Texas, Mexican authorities blamed much of the Texian unrest on American immigrants, most of whom had entered illegally and made little effort to adapt to the Mexican culture. In October, Texians engaged Mexican troops in the first official battle of the Texas Revolution. Determined to quell the rebellion of immigrants, Santa Anna began assembling a large force, the Army of Operations in Texas, to restore order. Most of his soldiers were raw recruits, and a large number had been forcibly conscripted. The Fall of the Alamo, painted by Theodore Gentilz in 1844, depicts the Alamo complex from the south. The Low Barracks, the chapel, and the wooden palisade connecting them are in the foreground. The Texians systematically defeated the Mexican troops already stationed in Texas. The last group of Mexican soldiers in the region—commanded by Santa Anna's brother-in-law, General Martín Perfecto de Cos—surrendered on December 9 following the siege of Béxar. By this point, the Texian Army was dominated by very recent arrivals to the region, primarily illegal immigrants from the United States. Many Texas settlers, unprepared for a long campaign, had returned home. Angered by what he perceived to be American interference in Mexican affairs, Santa Anna spearheaded a resolution classifying foreign immigrants found fighting in Texas as pirates. The resolution effectively banned the taking of prisoners of war: in this period of time, captured pirates were executed immediately. Santa Anna reiterated this message in a strongly worded letter to United States President Andrew Jackson. This letter was not widely distributed, and it is unlikely that most of the American recruits serving in the Texian Army were aware that there would be no prisoners of war. To compensate for the lack of firing ports, Texian engineer Green B. Jameson constructed catwalks to allow defenders to fire over the walls; this method, however, left the rifleman's upper body exposed. Mexican forces had left behind 19 cannons, which Jameson installed along the walls. A large 18-pounder had arrived in Texas with the New Orleans Greys. Jameson positioned this cannon in the southwest corner of the compound. He boasted to Texian Army commander Sam Houston that the Texians could "whip 10 to 1 with our artillery". The Texian garrison was woefully undermanned and underprovisioned, with fewer than 100 soldiers remaining by January 6, 1836. Colonel James C. Neill, the acting Alamo commander, wrote to the provisional government: "If there has ever been a dollar here I have no knowledge of it". Neill requested additional troops and supplies, stressing that the garrison was likely to be unable to withstand a siege lasting longer than four days. The Texian government was in turmoil and unable to provide much assistance. [Note 2] Four different men claimed to have been given command over the entire army:[Note 3] on January 14, Neill approached one of them, Sam Houston, for assistance in gathering supplies, clothing, and ammunition. James Bowie arrived at the Alamo Mission on January 19 with orders to destroy the complex. He instead became the garrison's co-commander. Houston could not spare the number of men necessary to mount a successful defense. Instead, he sent Colonel James Bowie with 30 men to remove the artillery from the Alamo and destroy the complex. [Note 4] Bowie was unable to transport the artillery since the Alamo garrison lacked the necessary draft animals. Neill soon persuaded Bowie that the location held strategic importance. 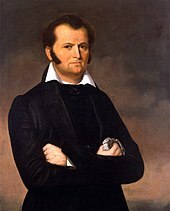 In a letter to Governor Henry Smith, Bowie argued that "the salvation of Texas depends in great measure on keeping Béxar out of the hands of the enemy. It serves as the frontier picquet guard, and if it were in the possession of Santa Anna, there is no stronghold from which to repel him in his march towards the Sabine. "[Note 5] The letter to Smith ended, "Colonel Neill and myself have come to the solemn resolution that we will rather die in these ditches than give it up to the enemy." Bowie also wrote to the provisional government, asking for "men, money, rifles, and cannon powder". Few reinforcements were authorized; cavalry officer William B. Travis arrived in Béxar with 30 men on February 3. Five days later, a small group of volunteers arrived, including the famous frontiersman and former U.S. Congressman David Crockett of Tennessee. General Antonio Lopez de Santa Anna led Mexican troops into Texas in 1836. On February 11, Neill left the Alamo, determined to recruit additional reinforcements and gather supplies. He transferred command to Travis, the highest-ranking regular army officer in the garrison. Volunteers comprised much of the garrison, and they were unwilling to accept Travis as their leader. [Note 6] The men instead elected Bowie, who had a reputation as a fierce fighter, as their commander. Bowie celebrated by getting very intoxicated and creating havoc in Béxar. To mitigate the resulting ill feelings, Bowie agreed to share command with Travis. As the Texians struggled to find men and supplies, Santa Anna continued to gather men at San Luis Potosi; by the end of 1835 his army numbered 6,019 soldiers. Rather than advance along the coast, where supplies and reinforcements could be easily delivered by sea, Santa Anna ordered his army inland to Béxar, the political center of Texas and the site of Cos's defeat. The army began its march north in late December. Officers used the long journey to train the men. Many of the new recruits did not know how to use the sights of their guns, and many refused to fire from the shoulder because of the large recoil. Progress was slow. There were not enough mules to transport all of the supplies, and many of the teamsters, all civilians, quit when their pay was delayed. The large number of soldaderas – women and children who followed the army – consumed much of the already scarce supplies. The soldiers were soon reduced to partial rations. On February 12 they crossed the Rio Grande. [Note 7] Temperatures in Texas reached record lows, and by February 13 an estimated 15–16 inches (38–41 cm) of snow had fallen. Hypothermia, dysentery, and Comanche raiding parties took a heavy toll on the Mexican soldiers. On February 21, Santa Anna and his vanguard reached the banks of the Medina River, 25 miles (40 km) from Béxar. Unaware of the Mexican Army's proximity, the majority of the Alamo garrison joined Béxar residents at a fiesta. [Note 8] After learning of the planned celebration, Santa Anna ordered General Joaquín Ramírez y Sesma to immediately seize the unprotected Alamo, but sudden rains halted that raid. In the early hours of February 23, residents began fleeing Béxar, fearing the Mexican army's imminent arrival. Although unconvinced by the reports, Travis stationed a soldier in the San Fernando church bell tower, the highest location in town, to watch for signs of an approaching force. Several hours later, Texian scouts reported seeing Mexican troops 1.5 miles (2.4 km) outside the town. Few arrangements had been made for a potential siege. One group of Texians scrambled to herd cattle into the Alamo, while others scrounged for food in the recently abandoned houses. 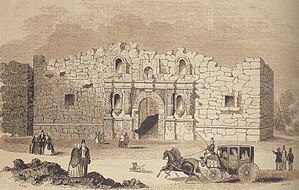 Several members of the garrison who had been living in town brought their families with them when they reported to the Alamo. Among these were Almaron Dickinson, who brought his wife Susanna and their infant daughter Angelina; Bowie, who was accompanied by his deceased wife's cousins, Gertrudis Navarro and Juana Navarro Alsbury, and Alsbury's young son; and Gregorio Esparza, whose family climbed through the window of the Alamo chapel after the Mexican army arrived. Other members of the garrison failed to report for duty; most of the men working outside Béxar did not try to sneak past Mexican lines. I reply to you, according to the order of His Excellency, that the Mexican army cannot come to terms under any conditions with rebellious foreigners to whom there is no recourse left, if they wish to save their lives, than to place themselves immediately at the disposal of the Supreme Government from whom alone they may expect clemency after some considerations. The first night of the siege was relatively quiet. Over the next few days, Mexican soldiers established artillery batteries, initially about 1,000 feet (300 m) from the south and east walls of the Alamo. A third battery was positioned southeast of the fort. Each night the batteries inched closer to the Alamo walls. During the first week of the siege more than 200 cannonballs landed in the Alamo plaza. At first, the Texians matched Mexican artillery fire, often reusing the Mexican cannonballs. On February 26 Travis ordered the artillery to conserve powder and shot. Two notable events occurred on Wednesday, February 24. At some point that day, Bowie collapsed from illness, leaving Travis in sole command of the garrison. Late that afternoon, two Mexican scouts became the first fatalities of the siege. [Note 9] The following morning, 200–300 Mexican soldiers crossed the San Antonio River and took cover in abandoned shacks near the Alamo walls. Several Texians ventured out to burn the huts while Texians within the Alamo provided cover fire. After a two-hour skirmish, the Mexican troops retreated to Béxar. Six Mexican soldiers were killed and four others were wounded. No Texians were injured. A blue norther blew in on February 25, dropping the temperature to 39 °F (4 °C). Neither army was prepared for the cold temperatures. Texian attempts to gather firewood were thwarted by Mexican troops. On the evening of February 26 Colonel Juan Bringas engaged several Texians who were burning more huts. According to historian J.R. Edmondson, one Texian was killed. Four days later, Texians shot and killed Private First Class Secundino Alvarez, a soldier from one of two battalions that Santa Anna had stationed on two sides of the Alamo. By March 1, the number of Mexican casualties were nine dead and four wounded, while the Texian garrison had lost only one man. I am determined to sustain myself as long as possible & die like a soldier who never forgets what is due to his own honor & that of his country. VICTORY OR DEATH. excerpt from William B. Travis's letter To the People of Texas & All Americans in the World. Santa Anna posted one company east of the Alamo, on the road to Gonzales. Almonte and 800 dragoons were stationed along the road to Goliad. Throughout the siege these towns had received multiple couriers, dispatched by Travis to plead for reinforcements and supplies. The most famous of his missives, written February 24, was addressed To the People of Texas & All Americans in the World. According to historian Mary Deborah Petite, the letter is "considered by many as one of the masterpieces of American patriotism." Copies of the letter were distributed across Texas, and eventually reprinted throughout the United States and much of Europe. 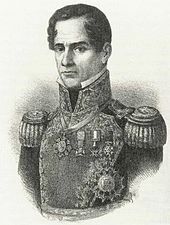 At the end of the first day of the siege, Santa Anna's troops were reinforced by 600 men under General Joaquin Ramirez y Sesma, bringing the Mexican army up to more than 2,000 men. As news of the siege spread throughout Texas, potential reinforcements gathered in Gonzales. They hoped to rendezvous with Colonel James Fannin, who was expected to arrive from Goliad with his garrison. On February 26, after days of indecision, Fannin ordered 320 men, four cannons, and several supply wagons to march towards the Alamo, 90 miles (140 km) away. This group traveled less than 1.0 mile (1.6 km) before turning back. Fannin blamed the retreat on his officers; the officers and enlisted men accused Fannin of aborting the mission. William B. Travis became sole Texian commander at the Alamo on February 24. On March 3, the Texians watched from the walls as approximately 1,000 Mexicans marched into Béxar. The Mexican army celebrated loudly throughout the afternoon, both in honor of their reinforcements and at the news that troops under General José de Urrea had soundly defeated Texian Colonel Frank W. Johnson at the Battle of San Patricio on February 27. Most of the Texians in the Alamo believed that Sesma had been leading the Mexican forces during the siege, and they mistakenly attributed the celebration to the arrival of Santa Anna. The reinforcements brought the number of Mexican soldiers in Béxar to almost 3,100. On March 4, the day after his reinforcements arrived, Santa Anna proposed an assault on the Alamo. Many of his senior officers recommended that they wait for two 12-pounder cannons anticipated to arrive on March 7. That evening, a local woman, likely Bowie's cousin-in-law Juana Navarro Alsbury, approached Santa Anna to negotiate a surrender for the Alamo occupiers. According to many historians, this visit probably increased Santa Anna's impatience; as historian Timothy Todish noted, "there would have been little glory in a bloodless victory". The following morning, Santa Anna announced to his staff that the assault would take place early on March 6. Santa Anna arranged for troops from Béxar to be excused from the front lines so that they would not be forced to fight their own families. Legend holds that at some point on March 5, Travis gathered his men and explained that an attack was imminent, and that they were greatly outnumbered by the Mexican Army. He supposedly drew a line in the ground and asked those willing to die for the Texian cause to cross and stand alongside him; only one man (Moses Rose) was said to have declined. Most scholars disregard this tale as there is no primary source evidence to support it (the story only surfaced decades after the battle in a third-hand account). However, Travis apparently did, at some point prior to the final assault, assemble the men for a conference to inform them of the dire situation and giving them the chance to either escape or stay and die for the cause. 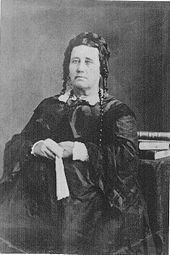 Susannah Dickinson recalled Travis announcing that any men who wished to escape should let it be known and step out of ranks. The last Texian verified to have left the Alamo was James Allen, a courier who carried personal messages from Travis and several of the other men on March 5. At 10 p.m. on March 5, the Mexican artillery ceased their bombardment. As Santa Anna had anticipated, the exhausted Texians soon fell into the first uninterrupted sleep many of them had since the siege began. Just after midnight, more than 2,000 Mexican soldiers began preparing for the final assault. Fewer than 1,800 were divided into four columns, commanded by Cos, Colonel Francisco Duque, Colonel José María Romero and Colonel Juan Morales. Veterans were positioned on the outside of the columns to better control the new recruits and conscripts in the middle. As a precaution, 500 Mexican cavalry were positioned around the Alamo to prevent escape of either Texian or Mexican soldiers. Santa Anna remained in camp with the 400 reserves. Despite the bitter cold, the soldiers were ordered not to wear overcoats which could impede their movements. Clouds concealed the moon and thus the movements of the soldiers. At 5:30 a.m. troops silently advanced. Cos and his men approached the northwest corner of the Alamo, while Duque led his men from the northwest towards a repaired breach in the Alamo's north wall. 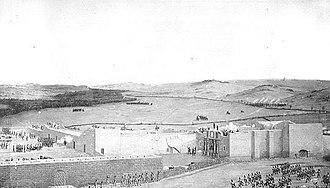 The column commanded by Romero marched towards the east wall, and Morales's column aimed for the low parapet by the chapel. The three Texian sentinels stationed outside the walls were killed in their sleep, allowing Mexican soldiers to approach undetected within musket range of the walls. At this point, the silence was broken by shouts of "¡Viva Santa Anna!" and music from the buglers. The noise woke the Texians. Most of the noncombatants gathered in the church sacristy for safety. Travis rushed to his post yelling, "Come on boys, the Mexicans are upon us and we'll give them hell!" and, as he passed a group of Tejanos, "¡No rendirse, muchachos!" ("Don't surrender, boys"). 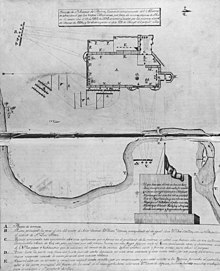 This plan of the Alamo was created by José Juan Sánchez Navarro in 1836. Places marked R and V denote Mexican cannon; position S indicates Cos's forces. In the initial moments of the assault, Mexican troops were at a disadvantage. Their column formation allowed only the front rows of soldiers to fire safely. Unaware of the dangers, the untrained recruits in the ranks "blindly fir[ed] their guns", injuring or killing the troops in front of them. The tight concentration of troops also offered an excellent target for the Texian artillery. Lacking canister shot, Texians filled their cannon with any metal they could find, including door hinges, nails, and chopped-up horseshoes, essentially turning the cannon into giant shotguns. According to the diary of José Enrique de la Peña, "a single cannon volley did away with half the company of chasseurs from Toluca". Duque fell from his horse after suffering a wound in his thigh and was almost trampled by his own men. General Manuel Castrillón quickly assumed command of Duque's column. Although some in the front of the Mexican ranks wavered, soldiers in the rear pushed them on. As the troops massed against the walls, Texians were forced to lean over the walls to shoot, leaving them exposed to Mexican fire. Travis became one of the first occupiers to die, shot while firing his shotgun into the soldiers below him, though one source says that he drew his sword and stabbed a Mexican officer who had stormed the wall before succumbing to his injury. Few of the Mexican ladders reached the walls. The few soldiers who were able to climb the ladders were quickly killed or beaten back. As the Texians discharged their previously loaded rifles, however, they found it increasingly difficult to reload while attempting to keep Mexican soldiers from scaling the walls. Mexican soldiers withdrew and regrouped, but their second attack was repulsed. Fifteen minutes into the battle, they attacked a third time. During the third strike, Romero's column, aiming for the east wall, was exposed to cannon fire and shifted to the north, mingling with the second column. Cos' column, under fire from Texians on the west wall, also veered north. When Santa Anna saw that the bulk of his army was massed against the north wall, he feared a rout; "panicked", he sent the reserves into the same area. The Mexican soldiers closest to the north wall realized that the makeshift wall contained many gaps and toeholds. One of the first to scale the 12-foot (3.7 m) wall was General Juan Amador; at his challenge, his men began swarming up the wall. Amador opened the postern in the north wall, allowing Mexican soldiers to pour into the complex. Others climbed through gun ports in the west wall, which had few occupiers. As the Texian occupiers abandoned the north wall and the northern end of the west wall, Texian gunners at the south end of the mission turned their cannon towards the north and fired into the advancing Mexican soldiers. This left the south end of the mission unprotected; within minutes Mexican soldiers had climbed the walls and killed the gunners, gaining control of the Alamo's 18-pounder cannon. By this time Romero's men had taken the east wall of the compound and were pouring in through the cattle pen. Last words of Texian defender Almaron Dickinson to his wife Susanna as he prepared to defend the chapel. As previously planned, most of the Texians fell back to the barracks and the chapel. Holes had been carved in the walls to allow the Texians to fire. Unable to reach the barracks, Texians stationed along the west wall headed west for the San Antonio River. When the cavalry charged, the Texians took cover and began firing from a ditch. Sesma was forced to send reinforcements, and the Texians were eventually killed. Sesma reported that this skirmish involved 50 Texians, but Edmondson believes that number was inflated. The occupiers in the cattle pen retreated into the horse corral. After discharging their weapons, the small band of Texians scrambled over the low wall, circled behind the church and raced on foot for the east prairie, which appeared empty. As the Mexican cavalry advanced on the group, Almaron Dickinson and his artillery crew turned a cannon around and fired into the cavalry, probably inflicting casualties. Nevertheless, all of the escaping Texians were killed. For the next hour, the Mexican army worked to secure complete control of the Alamo. Many of the remaining occupiers were ensconced in the fortified barracks rooms. In the confusion, the Texians had neglected to spike their cannon before retreating. Mexican soldiers turned the cannon towards the barracks. As each door was blown off Mexican soldiers would fire a volley of muskets into the dark room, then charge in for hand-to-hand combat. Too sick to participate in the battle, Bowie likely died in bed. Eyewitnesses to the battle gave conflicting accounts of his death. Some witnesses maintained that they saw several Mexican soldiers enter Bowie's room, bayonet him, and carry him alive from the room. Others claimed that Bowie shot himself or was killed by soldiers while too weak to lift his head. According to historian Wallace Chariton, the "most popular, and probably the most accurate" version is that Bowie died on his cot, "back braced against the wall, and using his pistols and his famous knife." The last of the Texians to die were the 11 men manning the two 12-pounder cannons in the chapel. A shot from the 18-pounder cannon destroyed the barricades at the front of the church, and Mexican soldiers entered the building after firing an initial musket volley. Dickinson's crew fired their cannon from the apse into the Mexican soldiers at the door. With no time to reload, the Texians, including Dickinson, Gregorio Esparza and James Bonham, grabbed rifles and fired before being bayoneted to death. Texian Robert Evans, the master of ordnance, had been tasked with keeping the gunpowder from falling into Mexican hands. Wounded, he crawled towards the powder magazine but was killed by a musket ball with his torch only inches from the powder. Had he succeeded, the blast would have destroyed the church and killed the women and children hiding in the sacristy. As soldiers approached the sacristy, one of the young sons of occupier Anthony Wolf stood to pull a blanket over his shoulders. In the dark, Mexican soldiers mistook him for an adult and killed him. [Note 14] Possibly the last Texian to die in battle was Jacob Walker, who attempted to hide behind Susannah Dickinson and was bayoneted in front of the women. Another Texian, Brigido Guerrero, also sought refuge in the sacristy. Guerrero, who had deserted from the Mexican Army in December 1835, was spared after convincing the soldiers he was a Texian prisoner. By 6:30 a.m. the battle for the Alamo was over. Mexican soldiers inspected each corpse, bayoneting any body that moved. Even with all of the Texians dead, Mexican soldiers continued to shoot, some killing each other in the confusion. Mexican generals were unable to stop the bloodlust and appealed to Santa Anna for help. Although the general showed himself, the violence continued and the buglers were finally ordered to sound a retreat. For 15 minutes after that, soldiers continued to fire into dead bodies. A crypt in the San Fernando Cathedral purports to hold the ashes of the Alamo occupiers. Historians believe it is more likely that the ashes were buried near the Alamo. Santa Anna reportedly told Captain Fernando Urizza that the battle "was but a small affair". Another officer then remarked that "with another such victory as this, we'll go to the devil". [Note 17] In his initial report Santa Anna claimed that 600 Texians had been killed, with only 70 Mexican soldiers killed and 300 wounded. His secretary, Ramón Martínez Caro, later repudiated the report. Other estimates of the number of Mexican soldiers killed ranged from 60–200, with an additional 250–300 wounded. Most Alamo historians place the number of Mexican casualties at 400–600. This would represent about one-third of the Mexican soldiers involved in the final assault, which Todish remarks is "a tremendous casualty rate by any standards". Most eyewitnesses counted between 182–257 Texians killed. Some historians believe that at least one Texian, Henry Warnell, successfully escaped from the battle. Warnell died several months later of wounds incurred either during the final battle or during his escape as a courier. Mexican soldiers were buried in the local cemetery, Campo Santo. [Note 18] Shortly after the battle, Colonel José Juan Sanchez Navarro proposed that a monument should be erected to the fallen Mexican soldiers. Cos rejected the idea. The Texian bodies were stacked and burned. [Note 19] The only exception was the body of Gregorio Esparza. His brother Francisco, an officer in Santa Anna's army, received permission to give Gregorio a proper burial. The ashes were left where they fell until February 1837, when Juan Seguín returned to Béxar to examine the remains. A simple coffin inscribed with the names Travis, Crockett, and Bowie was filled with ashes from the funeral pyres. According to a March 28, 1837, article in the Telegraph and Texas Register, Seguín buried the coffin under a peach tree grove. The spot was not marked and cannot now be identified. Seguín later claimed that he had placed the coffin in front of the altar at the San Fernando Cathedral. In July 1936 a coffin was discovered buried in that location, but according to historian Wallace Chariton, it is unlikely to actually contain the remains of the Alamo occupiers. Fragments of uniforms were found in the coffin, and it is known that the Alamo occupiers did not wear uniforms. Susanna Dickinson survived the Battle of the Alamo. Santa Anna sent her to spread word of the Texian defeat to the Texas colonists. In an attempt to convince other slaves in Texas to support the Mexican government over the Texian rebellion, Santa Anna spared Travis' slave, Joe. The day after the battle, he interviewed each noncombatant individually. Impressed with Susanna Dickinson, Santa Anna offered to adopt her infant daughter Angelina and have the child educated in Mexico City. Dickinson refused the offer, which was not extended to Juana Navarro Alsbury although her son was of similar age. Each woman was given a blanket and two silver pesos. Alsbury and the other Tejano women were allowed to return to their homes in Béxar; Dickinson, her daughter and Joe were sent to Gonzales, escorted by Ben. They were encouraged to relate the events of the battle, and to inform the remainder of the Texian forces that Santa Anna's army was unbeatable. During the siege, newly elected delegates from across Texas met at the Convention of 1836. On March 2, the delegates declared independence, forming the Republic of Texas. Four days later, the delegates at the convention received a dispatch Travis had written March 3 warning of his dire situation. Unaware that the Alamo had fallen, Robert Potter called for the convention to adjourn and march immediately to relieve the Alamo. Sam Houston convinced the delegates to remain in Washington-on-the-Brazos to develop a constitution. After being appointed sole commander of all Texian troops, Houston journeyed to Gonzales to take command of the 400 volunteers who were still waiting for Fannin to lead them to the Alamo. Within hours of Houston's arrival on March 11, Andres Barcenas and Anselmo Bergaras arrived with news that the Alamo had fallen and all Texians were slain. Hoping to halt a panic, Houston arrested the men as enemy spies. They were released hours later when Susannah Dickinson and Joe reached Gonzales and confirmed the report. Realizing that the Mexican army would soon advance towards the Texian settlements, Houston advised all civilians in the area to evacuate and ordered his new army to retreat. This sparked a mass exodus, known as the Runaway Scrape, and most Texians, including members of the new government, fled east. Despite their losses at the Alamo, the Mexican army in Texas still outnumbered the Texian army by almost six to one. Santa Anna assumed that knowledge of the disparity in troop numbers and the fate of the Texian soldiers at the Alamo would quell the resistance, and that Texian soldiers would quickly leave the territory. News of the Alamo's fall had the opposite effect, however, and men flocked to join Houston's army. The New York Post editorialized that "had [Santa Anna] treated the vanquished with moderation and generosity, it would have been difficult if not impossible to awaken that general sympathy for the people of Texas which now impels so many adventurous and ardent spirits to throng to the aid of their brethren". On the afternoon of April 21 the Texian army attacked Santa Anna's camp near Lynchburg Ferry. The Mexican army was taken by surprise, and the Battle of San Jacinto was essentially over after 18 minutes. During the fighting, many of the Texian soldiers repeatedly cried "Remember the Alamo!" as they slaughtered fleeing Mexican troops. Santa Anna was captured the following day, and reportedly told Houston: "That man may consider himself born to no common destiny who has conquered the Napoleon of the West. And now it remains for him to be generous to the vanquished." Houston replied, "You should have remembered that at the Alamo". Santa Anna's life was spared, and he was forced to order his troops out of Texas, ending Mexican control of the province and bestowing some legitimacy on the new republic. Following the battle, Santa Anna was alternately viewed as a national hero or a pariah. Mexican perceptions of the battle often mirrored the prevailing viewpoint. Santa Anna had been disgraced following his capture at the Battle of San Jacinto, and many Mexican accounts of the battle were written by men who had been, or had become, his outspoken critics. Petite and many other historians believe that some of the stories, such as the execution of Crockett, may have been invented to further discredit Santa Anna. In Mexican history, the Texas campaign, including the Battle of the Alamo, was soon overshadowed by the Mexican–American War of 1846–48. In San Antonio de Béxar, the largely Tejano population viewed the Alamo complex as more than just a battle site; it represented decades of assistance—as a mission, a hospital, or a military post. As the English-speaking population increased, the complex became best known for the battle. Focus has centered primarily on the Texian occupiers, with little emphasis given to the role of the Tejano soldiers who served in the Texian army or the actions of the Mexican army. In the early 20th century the Texas Legislature purchased the property and appointed the Daughters of the Republic of Texas as permanent caretakers of what is now an official state shrine. In front of the church, in the center of Alamo Plaza, stands a cenotaph, designed by Pompeo Coppini, which commemorates the Texians and Tejanos who died during the battle. According to Bill Groneman's Battlefields of Texas, the Alamo has become "the most popular tourist site in Texas". The first English-language histories of the battle were written and published by Texas Ranger and amateur historian John Henry Brown. The next major treatment of the battle was Reuben Potter's The Fall of the Alamo, published in The Magazine of American History in 1878. Potter based his work on interviews with many of the Mexican survivors of the battle. The first full-length, non-fiction book covering the battle, John Myers Myers' The Alamo, was published in 1948. In the decades since, the battle has featured prominently in many non-fiction works. According to Todish et al., "there can be little doubt that most Americans have probably formed many of their opinions on what occurred at the Alamo not from books, but from the various movies made about the battle." The first film version of the battle appeared in 1911, when Gaston Méliès directed The Immortal Alamo. The battle became more widely known after it was featured in the 1950s Disney miniseries Davy Crockett, which was largely based on myth. Within several years, John Wayne directed and starred in one of the best-known, but questionably accurate, film versions, 1960's The Alamo. [Note 20] Another film also called The Alamo was released in 2004. CNN described it as possibly "the most character-driven of all the movies made on the subject". It is also considered more faithful to the actual events than other movies. A number of songwriters have been inspired by the Battle of the Alamo. Tennessee Ernie Ford's "The Ballad of Davy Crockett" spent 16 weeks on the country music charts, peaking at No. 4 in 1955. Marty Robbins recorded a version of the song "The Ballad of the Alamo" in 1960 which spent 13 weeks on the pop charts, peaking at No. 34. Jane Bowers' song "Remember the Alamo" has been recorded by artists including Johnny Cash and Donovan. Singer-songwriter Phil Collins collected hundreds of items related to the battle, narrated a light and sound show about the Alamo, and has spoken at related events. In 2014 Collins donated his entire collection to the Alamo via the State of Texas. The battle also featured in episode 13 of The Time Tunnel, "The Alamo", first aired in 1966. The U.S. Post Office issued two postage stamps in commemoration of Texas Statehood and the Battle of Alamo. First stamp to commemorate battle was issued in 1936, the 100th anniversary of the battle, depicting Sam Houston and Stephen Austin. 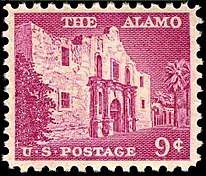 Second stamp, issued in 1956, depicts the facade of the Alamo mission. ^ Volunteers in the Texian Army asserted the right to choose their own leaders, and most of them were unwilling to serve under officers of the regular army. ^ Although the Rio Grande now marks the border between Texas and Mexico, in this era the Nueces River, several hundred miles north, was considered the southern boundary of Mexican Texas. ^ The fiesta was in celebration of the birthday of George Washington, the first president of the United States. ^ These Texian reinforcements were later dubbed the Immortal 32. ^ a b Hardin (2010). ^ a b c d e f g Todish et al. (1998), p. 55. ^ a b Hardin (1994), p. 155. ^ a b Nofi (1992), p. 136. ^ a b c Nofi (1992), p. 213. ^ Felipe Tena Ramírez, Leyes fundamentales de México, 1808-1971. pp. 202-248. ^ Todish et al. (1998), p. 6. ^ Barr (1990), p. 4. ^ a b Barr (1990), p. 56. ^ Hardin (1994), p. 99. ^ a b Barr (1990), p. 63. ^ Scott (2000), p. 71. ^ Scott (2000), pp. 74–75. ^ a b Edmondson (2000), p. 129. ^ Edmondson (2000), p. 128. ^ a b Edmondson (2000), p. 131. ^ a b Myers (1948), p. 181. ^ Todish et al. (1998), p. 10. ^ a b c d e Edmondson (2000), p. 364. ^ Myers (1948), p. 180. ^ Todish et al. (1998), p. 30. ^ Hopewell (1994), p. 114. ^ a b c d Hopewell (1994), p. 115. ^ Chariton (1992), p. 98. ^ a b Todish et al. (1998), p. 32. ^ Hopewell (1994), p. 116. ^ Hardin (1994), p. 120. ^ a b c Hardin (1994), p. 102. ^ Lord (1961), p. 67. ^ Lord (1961), p. 89. ^ a b Todish et al. (1998), p. 36. ^ a b Nofi (1992), p. 76. ^ Edmondson (2000), pp. 299–301. ^ Lord (1961), p. 95. ^ Lord (1961), p. 105. ^ Lindley (2003), p. 89. ^ a b c Todish et al. (1998), pp. 40–41. ^ a b Nofi (1992), p. 78. ^ a b Edmondson (2000), p. 308. ^ Edmondson (2000), p. 310. ^ Nofi (1992), p. 81. ^ a b c d e Todish et al. (1998), p. 43. ^ a b c d Hardin (1994), p. 132. ^ Petite (1999), p. 34. ^ a b Nofi (1992), p. 80. ^ a b c Todish et al. (1998), p. 42. ^ a b Tinkle (1985), p. 118. ^ Lord (1961), p. 109. ^ a b Tinkle (1985), p. 119. ^ Tinkle (1985), p. 120. ^ Nofi (1992), p. 83. ^ Todish et al. (1998), p. 44. ^ Lord (1961), p. 107. ^ Scott (2000), p. 102. ^ Myers (1948), p. 200. ^ Petite (1999), p. 88. ^ Petite (1998), p. 90. ^ Tinkle (1985), p. 162. ^ Edmondson (2000), p. 324. ^ Nofi (1992), p. 95. ^ Scott (2000), pp. 100–101. ^ Lindley (2003), p. 130. ^ Todish et al. (1998), p. 47. ^ Lindley (2003), p. 140. ^ a b Lindley (2003), p. 142. ^ Lindley (2003), pp. 137–38. ^ Todish et al. (1998), p. 48. ^ Hopewell (1994), p. 126. ^ Chariton (1992), p. 195. ^ Hardin (1994), p. 124. ^ Edmondson (2000), p. 360. ^ a b Edmondson (2000), p. 356. ^ a b c d Edmondson (2000), p. 357. ^ a b Todish et al. (1998), p. 51. ^ a b Edmondson (2000), p. 362. ^ a b Hardin (1994), p. 138. ^ Todish et al. (1998), p. 50. ^ a b Lord (1961), p. 160. ^ a b Hardin (1994), pp. 138-139. ^ a b c d Hardin (1994), p. 139. ^ a b Tinkle (1985), p. 196. ^ Edmondson (2000), p. 363. ^ a b c d e Todish et al. (1998), p. 52. ^ Petite (1998), p. 113. ^ Hardin (1994), p. 146. ^ a b c d Hardin (1994), p. 147. ^ a b c d Todish et al. (1998), p. 53. ^ Petite (1998), p. 112. ^ a b c d Edmondson (2000), p. 366. ^ a b Edmondson (2000), p. 368. ^ a b Edmondson (2000), p. 367. ^ Edmondson (2000), p. 369. ^ a b Todish et al. (1998), p. 54. ^ Petite (1998), p. 114. ^ a b Edmondson (2000), p. 370. ^ Groneman (1996), p. 214. ^ a b Hopewell (1994), p. 127. ^ Chariton (1992), p. 74. ^ Petite (1998), p. 115. ^ a b c d Edmondson (2000), p. 371. ^ Tinkle (1985), p. 216. ^ a b c Edmondson (2000), p. 372. ^ Tinkle (1985), p. 218. ^ a b Lord (1961), p. 166. ^ Tinkle (1985), p. 220. ^ Edmondson (2000), p. 373. ^ a b Petite (1998), p. 123. ^ Tinkle (1985), p. 214. ^ a b Petite (1998), p. 124. ^ Lord (1961), p. 167. ^ a b c d Edmondson (2000), p. 374. ^ Hardin (1994), p. 156. ^ Nofi (1992), p. 133. ^ Edmondson (2000), p. 407. ^ Petite (1998), p. 134. ^ Petite (1998), p. 131. ^ a b Chariton (1990), p. 78. ^ Petite (1998), p. 132. ^ Petite (1998), p. 128. ^ Petite (1998), p. 127. ^ Nofi (1992), p. 138. ^ Edmondson (2000), p. 376. ^ Lord (1961), p. 190. ^ a b Edmondson (2000), p. 378. ^ a b Schoelwer & Gläser (1985), p. 98. ^ Schoelwer & Gläser (1985), p. 18. ^ Schoelwer & Gläser (1985), pp. 52, 56. ^ a b Groneman (1998), p. 52. ^ Groneman (1998), p. 56. ^ a b Lindley (2003), p. 106. ^ Nofi (1992), p. 211. ^ Todish et al. (1998), p. 187. ^ Todish et al. (1998), p. 194. ^ Todish et al. (1998), p. 196. ^ Edwards (2009), p. 148Retrieved February 18, 2012. ^ Chemerka & Wiener (2009), p. 157Retrieved February 18, 2012. ^ "Texas Centennial Issue". Smithsonian National Postal Museum. ^ "9-cent The Alamo". Smithsonian National Postal Museum. Barr, Alwyn (1996). Black Texans: A history of African Americans in Texas, 1528–1995 (2nd ed.). Norman, OK: University of Oklahoma Press. ISBN 978-0-8061-2878-8. Chemerka, William H.; Wiener, Allen J. (2009). Music of the Alamo. Bright Sky Press. ISBN 978-1-933979-31-1. Cobler, Nicole (March 11, 2015). "Phil Collins' star rises over the Alamo". San Antonio Express-News. Retrieved March 26, 2018. Cox, Mike (March 6, 1998). "Last of the Alamo big books rests with 'A Time to Stand'". The Austin-American Statesman. Culpepper, Andy (April 8, 2004). "A different take on 'The Alamo'". CNN. Retrieved May 22, 2008. Edwards, Leigh H. (2009). Johnny Cash and the paradox of American identity. Indiana University Press. ISBN 978-0-253-35292-7. Hardin, Stephen L. (June 9, 2010). "Battle of The Alamo". Handbook of Texas Online. Texas State Historical Association. Retrieved December 11, 2014. Michels, Patrick (May 11, 2010). "Remembering the Alamo with Phil Collins". Dallas Observer. Retrieved December 22, 2017. Schoelwer, Susan Prendergast; Gläser, Tom W. (1985). Alamo Images: Changing Perceptions of a Texas Experience. Dallas, TX: The DeGlolyer Library and Southern Methodist University Press. ISBN 978-0-87074-213-2. N/A (July 21, 2014). "Phil Collins Press Conference". The Official Alamo Website. Archived from the original on September 28, 2014. Retrieved September 22, 2014. Crisp, James E. (2005). Sleuthing the Alamo. Oxford University Press. ISBN 978-0-195-16349-0. Davis, William C. (1998). Three Roads to the Alamo: The Lives and Fortunes of David Crockett, James Bowie, and William Barret Travis. HarperCollins. ISBN 978-0-060-17334-0. Dole, Gerard (2011). Texas 1836 – Musical Echoes from the Alamo (paperback). Paris: Terre de Brume. ISBN 978-2-843-62474-2. Donovan, James (2012). The Blood of Heroes: The 13-Day Struggle for the Alamo – and the Sacrifice That Forged a Nation. Little, Brown and Company. ISBN 978-0-316-05374-7. Fehrenbach, T.R. (June 1967). "Remember the Alamo!". In Campbell, John W. (ed.). Analog One (paperback). ISBN 978-0-586-02256-6. Sci-Fi story about a time traveller who goes back to the Alamo at the time of the battle – and gets trapped in the past. Hardin, Stephen L. (2001). The Alamo 1836: Santa Anna's Texas Campaign. Osprey Campaign Series #89. Osprey Publishing. ISBN 978-1-841-76090-2. This page was last edited on 7 April 2019, at 22:05 (UTC).